ELLENVILLE, NY, (September 19, 2013) – Wow! Just wow! Yes, it’s that wonderful. It’s that stirring, that emotional, that dramatic and that moving. Wow! 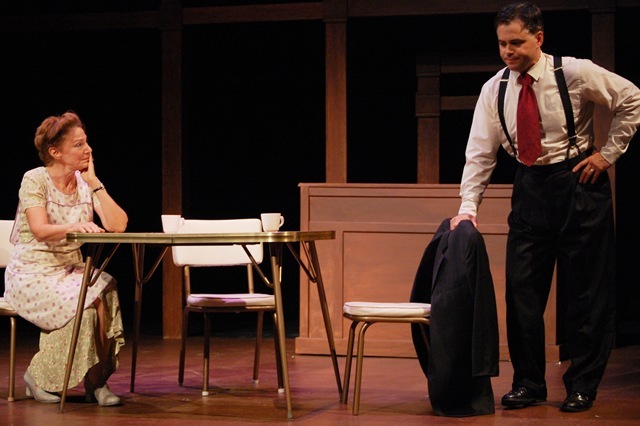 It’s Shadowland Theatre’s current production of “Bill W. and Dr. Bob,” written by Samuel Shem and Janet Surrey, expertly directed by Artistic Director Brendan Burke. And it tells the story of the creation of Alcoholic’s Anonymous. 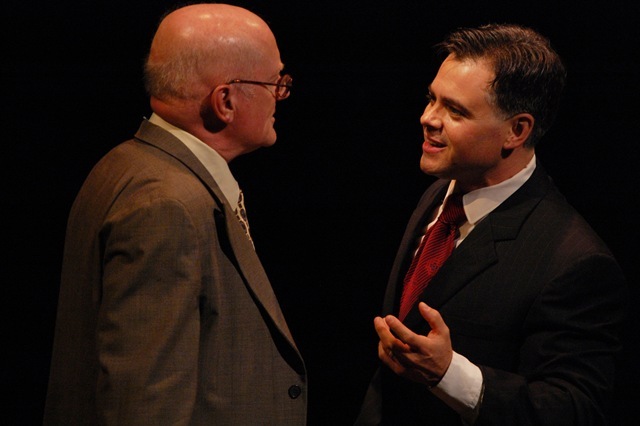 Delving deeply into the lives of AA’s founders, Bill Wilson and Dr. Bob Smith, the play chronicles their separate descents into chronic alcoholism, their fateful meeting and their slow, agonizingly painful ascent out of the addiction. Along the way comes the realization that only a drunk can help another drunk. 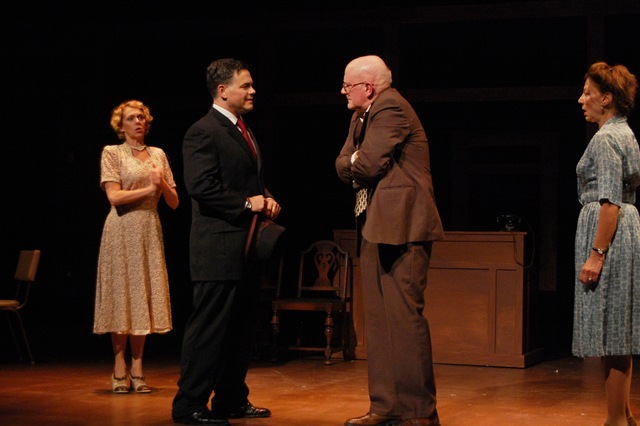 In a perfect pairing, Shadowland’s production of “Bill W. and Dr. Bob” is produced by the Villa Veritas Foundation, an inpatient rehabilitation and wellness center, located in Kerhonkson, NY. And in the spirit of verisimilitude, the cast’s research included a visit to the Villa Veritas facility. 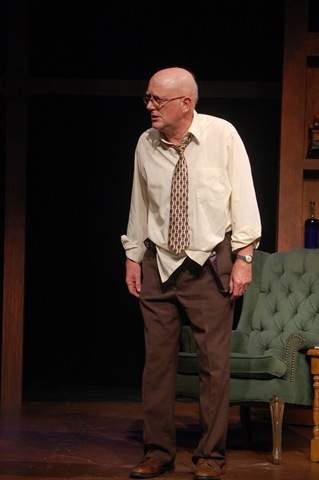 Steve Brady, wonderful in Shadowland’s “The Dangers of Electric Lighting” and “The Ladies’ Man” among others, is absolutely brilliant in his portrayal of Dr. Bob. He is a warm, caring country doctor who just happens to be a raging, falling-down drunk – in his home, in his practice and yes, even in his surgery. He is scary and pitiful, but also lovable and charming, evoking true emotion and tears as the audience struggles with his every alcoholic episode. Bill W. is portrayed by Galway McCullough. He is an Everyman – a neighbor, a friend, and in this case, a famous stockbroker whose world spins out of control along with the Great Depression. 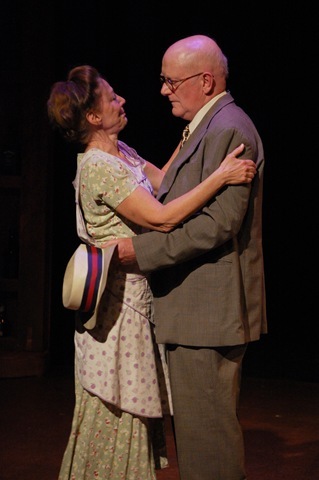 McCullough’s performance is spot-on as the husband desperate to please his wife, but caught by this dreadful disease that grips him like a lobster claw and won’t let go. A beautiful performance of a loyal man who’s fiercely determined to beat this thing in the best way he knows how. The grip of his desire to be free is as strong as the disease’s hold. McCullough is perfectly cast. Jen Burry as Bill’s wife, Lois Wilson, and Lori Wilner as Bob’s wife, Anne Smith are flawless as the long-suffering wives. Lois is fiercely loyal and protective, seeking consolation in her friendships, while Anne is more conflicted, not sure which way to turn, whether to stay or go. It is inevitable then that, after the wives meet and commiserate, they become the founders of Al- Anon. David Smilow (Man) and Brenny Rabine (Woman) play many different parts, and Smilow especially does a yeoman’s job in 10 different parts. Both are talented and endowed with the ability to change characters (and oftentimes costumes) quickly and convincingly. Speaking of costumes, designer Holly Lewis Budd does fine work outfitting everyone in period style. And the set designed by Drew Francis is picture-perfect: an open wooden framework with several wide openings for entrances and exits, and lined with liquor bottles in various stages of emptiness. Brilliant acting, brilliant design, brilliant direction. Shadowland’s “Bill W. and Dr. Bob” is a theatrical triumph. Playing now through September 29, tickets for “Bill W. and Dr. Bob” are $35 Thursday through Saturday, and $30 on Sunday. There is a $2 student or senior discount, and group sale discounts are also available. Show times are 8:00 p.m. on Thursdays – Saturdays, and 2:00 p.m. on Sunday. To reserve tickets, call the Shadowland Theatre box office at 845-647-5511, or visit http://www.shadowlandtheatre.org.